Photo by Alamy / The Telegraph. Individual rights of conscience and religious diversity cannot be maintained when the government promotes one religion over others. SAN MARCOS, Texas -- On Tuesday, September 25, the Hays County Commissioners Court held a public discussion to receive comment from citizens about a legal and constitutional issue that none of the speakers knew much about, but they all had opinions, some quite emotional. 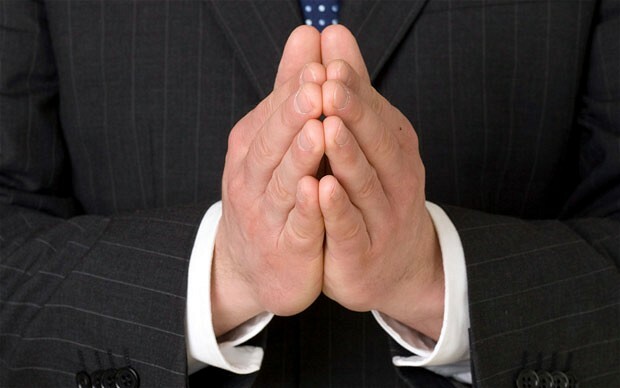 The issue concerned the court’s mostly Christian prayers used to open their meetings. Not surprisingly, those who spoke overwhelmingly favored having the court continue to promote Christian prayers at its meetings. A little background might be helpful in sorting out the chafe from the wheat about this issue. This has not been a long-standing practice in Hays County. Some 150 years after Hays County was created, County Judge Jim Powers, in 1998, began the prayer practice. Several times since then, I have reviewed the invocations (mostly prayers, but sometimes a moment of silence) offered at Commissioner Court meetings. Clearly, these phrases and many others in the invocations create an appearance that the Commissioners Court is promoting Christianity, and in some cases, a particular brand of Christianity. Such actions also convey the message that the meetings of the Hays County Commissioner’s Court are in some way blessed by the God approved by the members of the Commissioners Court, but not by the gods that other Hays County citizens believe in and worship. It is inappropriate for these county politicians to introduce their religion into the governing of Hays County in this way. While members of the Commissioners Court may decide issues that come before the court on the basis of many considerations, including their personal religious views, it is inappropriate to give the impression that the Commissioners Court acts in the name of the Christian God, which is the impression given when their meetings are opened in the name of that God. In Marsh, the invocation prayers were directed only to legislators in the Nebraska Legislature and were offered by the Legislative Chaplain. The prayers never included any reference to Jesus or other Christian symbols or language, so they did not “advance” Christianity. Under these narrow circumstances, the Supreme Court concluded that the prayers did not violate the Establishment Clause of the U.S. Constitution. Generally, these kinds of prayers are referred to as nonsectarian. But even nonsectarian prayers make clear that the sponsor of the prayers (the Hays County Commissioners Court in this case) favors religion over non-religion. When the prayers use the name of Jesus, or include Christian symbols and language normally identified with Christian doctrine or belief, a reasonable conclusion would be that the Commissioners Court favors Christianity over other religions. When Jim Powers began this prayer practice, he set about to promote his own brand of religion through his elected position. He probably did not intend to attack the religious liberty of everyone who held different religious views, but that was the effect of his having almost exclusively Christian prayers at the beginning of each regular meeting of the Commissioners Court. Two subsequent Hays County Judges, with the acquiescence of a majority of the County Commissioners, have continued the practice. By forcing the religious practices of a particular religion on those in the county who don’t follow the tenets of that religion, the Commissioners Court deprives those citizens of their religious liberty. While everyone under our constitution has the right to follow whatever religion they choose, the members of the Commissioners Court do not have the right to use their governmental power to force their religious beliefs on everyone. Commissioners Court members have taken the position that they have the right to compel their favored religious practices on others and they use public funds, buildings, and resources to do so. In effect, the Commissioners Court says that if it is not allowed to open its meetings with mostly Christian prayers, the members’ own religious liberty will be harmed or will be at risk. But a person’s religious liberty is not at risk because that person can’t force others to participate in his or her religious practices. They fail to appreciate that no religion should be given status as the official faith of the county or the country, even for one meeting. Neither the county government, nor the federal government can constitutionally elevate any religion to such a status. But nothing about the Marsh decision prevents a person from praying or engaging in whatever religious practices suit them so long as the government is not promoting those practices. The government should be neutral in matters of religion, neither favoring nor disfavoring any religion. Another aspect of the Marsh decision that should be noted is that the chaplain for the Nebraska Legislature directed the opening nonsectarian prayers to the members of the Legislature, not to other Nebraska citizens. By contrast, those who pray mostly Christian prayers before the Hays County Commissioners Court direct their prayers not only to the members of the Commission, but also to the audience of citizens in attendance (and those watching on video) without regard for the audience’s religious beliefs. Often those citizens in attendance are asked to stand, bow their heads, and even pray with the speaker. Sometimes they are asked to join in the prayer by saying “Amen” at the end of the prayer, as in, “And all God’s children said Amen,” a usual practice of one of the ministers who has given the invocation at Hays County Commissioners Court meetings several times in recent years. In a constitutional democracy such as ours, the majority cannot run roughshod over the constitutional rights of a minority. Public opinion has no role in determining what is constitutional; otherwise, blacks, Jews, and other minorities would still be prohibited from living in many communities. So it is fair to ask what the purpose was of conducting a public hearing on whether citizens favor Christian prayer over other kinds of prayer? The only answer that comes to my mind is that County Judge Bert Cobb and others on the Commissioners Court are playing politics with the religious liberty of us all. It doesn’t matter what the majority says about religion; each of us is entitled to our own religious beliefs, practices, and preferences, without interference, direction, influence, or promotion by county officials. One of the clergy who sometimes offers public government-sponsored prayers in Hays County asserted that “it can’t hurt to have a prayer.” On the contrary, the freedom of religion guaranteed by the U.S. Constitution’s First Amendment necessarily carries with it the right to be free from religion imposed by the government, just as the freedom of speech does not permit the government to require me to speak, nor does the freedom of association require me to associate with those the government wants me to associate with. When the government uses the religious practice of prayer while carrying out its civic functions, it compels all citizens who want to participate in our civic life or observe its government in action to partake of that religious exercise. Most of those who cooperate with government bodies to promote prayer do so with noble intentions bereft of an appreciation of how their use of government to advance religion violates the rights of those who have different religious beliefs. For instance, no one should have to participate in another’s religious practice in order to participate in their government, but this is exactly what the Hays County Commissioners Court compels them to do by its sanctioning of official prayer at its meetings. [W]henever men fly to the law or the sword to protect their system of religion and force it upon others, it is evident that they have something in their system that will not bear the light and stand upon the basis of truth. The framers [of the Constitution] sought to divorce religion from government. ... [T]o make religion dependent upon government was to depreciate true religion; to rely upon government to throw its weight behind religion was to declare God impotent to further his purposes through voluntary means. A long line of America’s founders, patriots, and U.S. presidents from George Washington to Jimmy Carter appreciated the need to keep government out of religion, but that history is meaningless when no member of the Hays County Commissioners Court will rise to the defense of our forebears and the Constitution and oppose government sponsorship of religion in our civic life. We live in a country that welcomes people of many faiths and of none. In countries where religion and government are commingled, the government usually oppresses those who do not follow the tenets of the dominant religion. Our history has shown that the principle of separation of church and state protects the religious freedom that we all have. Individual rights of conscience and religious diversity cannot be maintained when the government promotes one religion over others. The neutrality toward religion that is found in our Constitution protects the freedom of us all. One of the greatest ironies of this government prayer promotion is that the most prominent proponents of it are the Christian evangelicals, who believe most literally in the words of the Bible. None of them have ever explained publicly how their behavior can be reconciled with the teachings of Jesus to pray in secret and not in public where they can be seen by others as pious. If all who call themselves Christian followed the admonitions of Jesus, we would not have a problem with sectarian prayers at government meetings in Hays County and throughout the United States. Any religion that needs the imprimatur of government to fulfill its purposes is trivial at best and tyrannical at worst.